Backyard Makeovers is dedicated to showing you how to take an old, dated, impractical garden or outdoor living area and turn it into an attractive, multi-functional outdoor space that will enhance your family’s lifestyle and improve the value of your home. 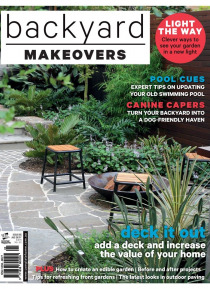 Backyard Makeovers covers feature articles on everything regarding the makeover plan, including working with design professionals, choosing t… he best materials and products for you, plant selection, maximising your space and tips for keeping the garden within your budget. Plus the magazine features before and after transformations which will help to inspire your own stunning makeover.